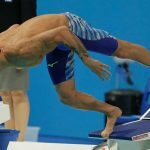 The swimming warm-down: often the first thing to get thrown out the window at the end of a session or after a bad race. Here is why you should commit to warming down after every race. What is the point of warming down after your race? I have heard (and may or may not have said it myself) this on pool decks on countless occasions. 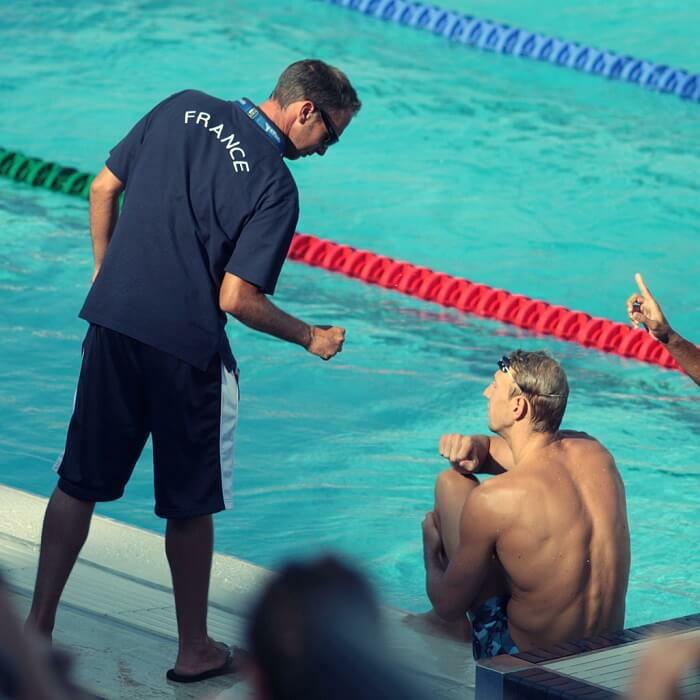 Particularly when you have a disappointing race, or your event was the last of the day, it’s tempting to think that warming down is a waste of time. After all, it’s not like warming up, where you are getting prepared for a future race. The race is over, so what’s the big deal? But, as research shows, the way you perform tomorrow is reliant on how you take care of yourself today. It gives you a chance to reset mentally after your previous race. Returns your body back to resting levels. This includes the flushing of lactate, and perhaps most critically, allowing your neuromuscular system to recover. Keeps you producing at a higher level more consistently, especially over the course of long meets where you are racing frequently. Low intensity recovery work has been shown to have positive psychological effects, with effects including improved mood and relaxation. Which is exactly what is needed after a big race. Effects of a hard effort last much longer than just when your blood lactate levels return to pre-race levels. Warming down helps all of your body’s systems to heal. How much do I need to warm-down? Obviously, this answer will vary from athlete to athlete. 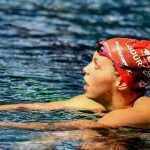 Depending on your discipline, your level of conditioning, and of course, when your next swim is you might be constrained on how long you can spend winding yourself down after racing. 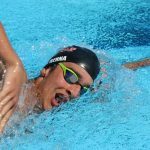 Because sprint swimmers tend to have more muscle mass than their distance brothers and sisters, as well as a higher level of fast-twitch muscles, they actually need more warm-down. But if time is not a constraint, what is the ideal amount of time you should be warming down? 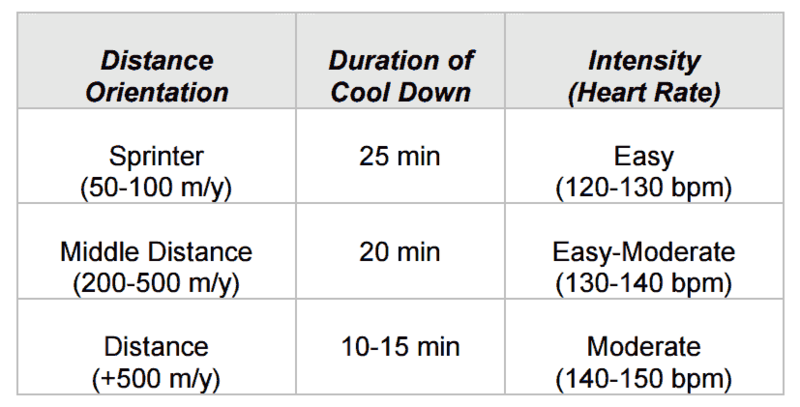 If you can tell what your initial blood lactate level is you can use the following table to give yourself a better idea of how long you should spend warming down. 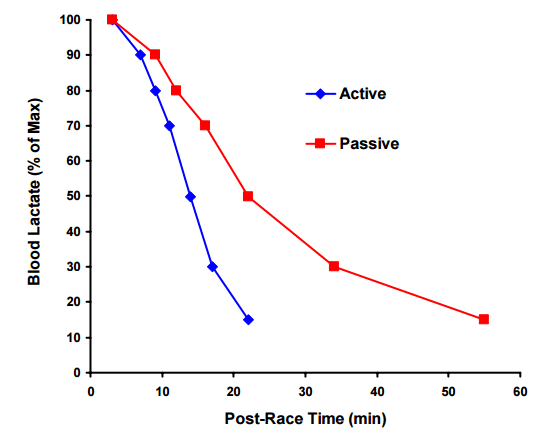 The graph above shows that when the swimmer does nothing, they return to the same blood lactate level after 55 minutes. So naturally, for swimmers who are only competing once per day, or who have ample time between events, what’s the point of warming down at all? Well, it’s possible that we have been ignoring the real reason we need warm-down. Your nervous system needs recovery. What if the benefits of warming down wasn’t really about flushing lactate, but because your neurons are tired and in need of recovery? A study of nationally ranked Finnish track athletes (Vitasalo et al., 1995) found that those who engaged in a protocol of 20 minutes of jet massage in the hot tub performed better in explosive and strength movements the following day compared to their non-recoverin’ teammates. In other words, warming down helped them ward off the effects of neuromuscular fatigue. 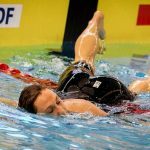 This is important for swimmers when you consider that the athletes in the control group of this study were experiencing the effects of neuromuscular fatigue a full day after training. It wasn’t lactate build-up that was causing them to incur lower performances. This study should be an alarming reminder of how crucial to performance warming down is not only during competition, but at the end of a tough training session as well. Ultimately, the main problem with neural fatigue is that there isn’t an easy way to measure it. It’s not like lactate where we can take a quick blood sample and know with precision how much is in the blood. Symptoms of neural fatigue are tough to accurately rate and include fatigue (obviously), mood swings, and even loss of appetite. 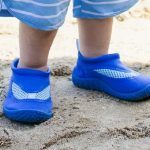 How fast or slow should I be warming-down? Hanging on the edge of the pool for twenty minutes talking to friends about their races isn’t warming down. 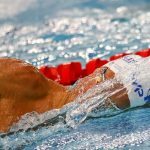 Nor is doing laps of high intensity swimming in the warm down that only serves to produce additional lactate or further strain your neuromuscular system. What if there is no warm-down pool? Not having a secondary pool is no excuse for not doing your due diligence in warming down properly after belting out a big swim. From doing arm and leg swings under a warm shower to doing low level biking on a stationary bike there are ways to get your warm-down in without getting wet. 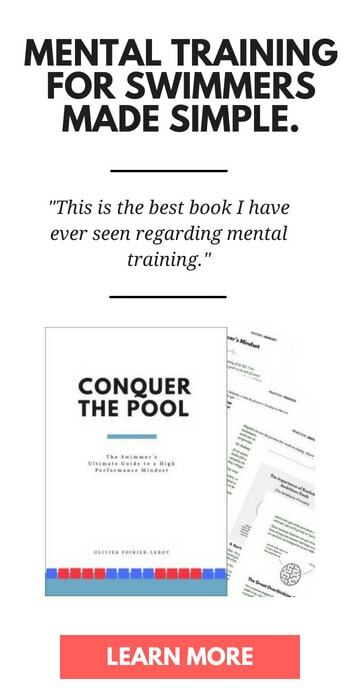 And mentally you know that not having a warm-down pool isn’t an issue if all the other swimmers are competing under the same circumstances. Make warming down a standard part of your post-race routine. Get some fluids and food in you to replenish glycogen stores following your race. 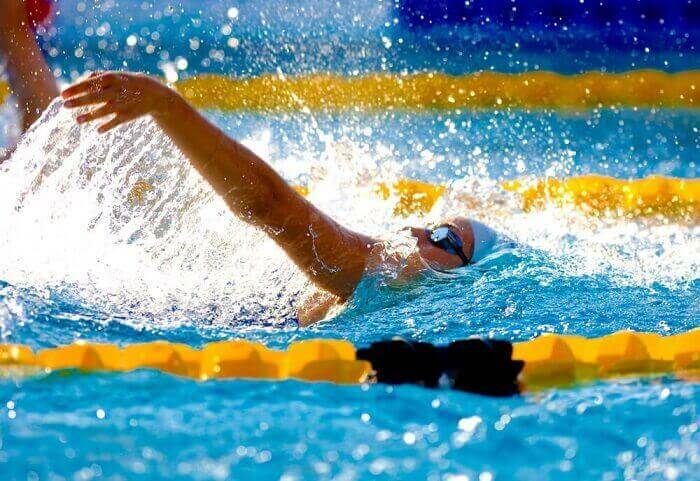 Head straight to the warm-down pool after your race. You can get the highlights (or low-lights), splits and words of encouragement from your coach afterwards. 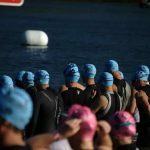 The more swims you have the longer you should be warming down after each subsequent race. 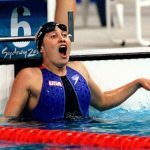 No matter the circumstances are like at the big meet, warming down is a crucial part of your competition strategy, whether you are competing once per day or like most swimmers, repeatedly in the span of a single session. Peyrebrune, M.(2006) Warm down and active recovery. English Institute of Sport.